Made To Bloom All-Inclusive Card Kit by Stampin' Up! Create beautiful all-occasion cards in minutes. Perfect for new crafters, busy crafters, or crafters on the go. 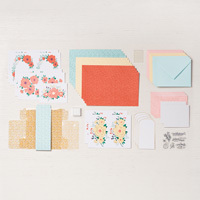 Makes 12 cards, 4 each of 3 designs, using the included Made to Bloom Stamp Set. Folded card size: 4-1/4" x 5-1/2" (10.8 x 14 cm).